If it is uncomfortable to lie down, you can stay seated during your treatment. Chiropractic First is a light touch chiropractic office. We will use very gentle pressure to help you heal. Our work is informed by BioGeometric Integration a model of chiropractic that focuses on the inherent connections in your body. These connections are in your muscles, in your tendons, in your bones and in all parts of your body. 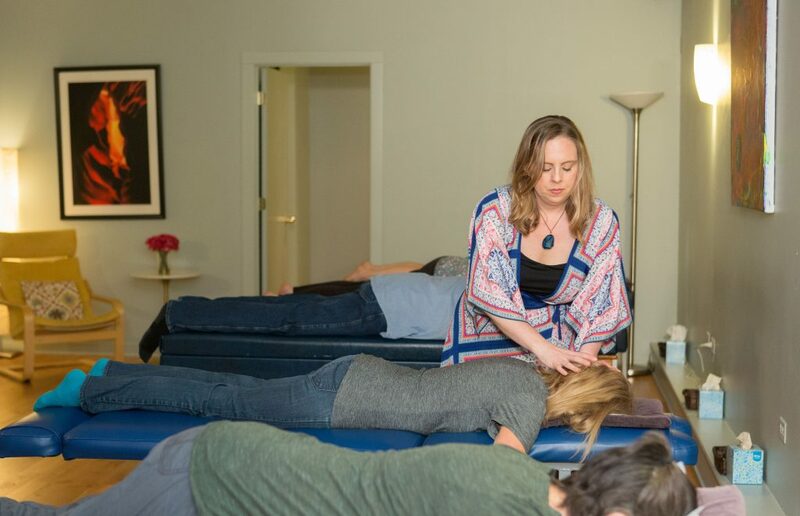 Dr. Smith and Dr. Vogds use knowledge of those connections to release tension and help your body heal. We work with your entire body, not just your spine. Imagine you’re holding a beach ball in your hands and you’re pressing down on it. Rather than breaking, the stress of the incoming force is distributed across the whole structure. The ball doesn’t collapse, but it does change shape. Every part of the ball moves and adapts in response to the pressure you put on just one part of the ball. A similar thing happens in your body. Until you remove the pressure, your entire body is altered by stress. This type of integration, called tensegrity, results in great strength! And yet, it causes stress and tension to be experienced throughout your body, not just in an isolated area. You will feel a relaxing gentle pressure. Your body and mind are impacted by physical, chemical, mental and emotional stress. This allows you to handle many more challenging situations than if only one part of your body managed the stress. However, it also results in stress being stored in our bodies until we release it. Your body is able to bear the burden and will adapt to the stresses in very specific ways. Physical stress in your lower back will be reflected in predicable parts of your middle back, neck and even legs and arms. Emotional stress in your shoulders will be connected to points in your ribs, stomach and hips. BGI uses this understanding of the body to release your burdens and help your inner vitality spring back. Unlike other forms of chiropractic, BGI works with your whole body and mind. Healing occurs quickly and your “bodymind” learns a new way of being. The doctors perform gentle adjustments to bring your whole system into harmony. Very rarely, if ever, will you feel the “cracking” type of adjustments people often associate with chiropractic. Dr. Smith has also studied Network Spinal Analysis, in addition to BGI. This approach addresses stress in your spine and nervous system. When the spinal cord and associated nerves are stretched or damaged, they lose the ability to properly coordinate with your brain and body. This embodied stress, or “defense physiology,” profoundly affects every aspect of your body-mind. When you are out of that defensive state, your body can properly function. You can then handle complex situations, emotions and behaviors more easily. A powerful healing energy is created by healing in community. However, a private room is always available if you prefer.